Click on the issue name to go to that section. Most recent years are listed first (e.g., 2014 Horse, then 2002 Horse). No, we didn't produce Dragon Cards for every year in the Clarence Lee series. In hindsight, we should have. With the new U.S. series that started in 2008, we will produce every Lunar New Year issue, with a series of unifying designs, and sometimes something a little different. The PayPal shopping cart system is working again for all items on this page. Some browsers, however, may still have problems. Dgn 632g: Sc. 5254/x Year of the Dog — 5"x7" Dragon Card showing a Year of the Dog icon and fireworks. The U.S. and Canadian international-rate stamps each have their own first-day cancels — larger illustration (new window). Dgn 632l: Sc. 5254 Year of the Dog — 5"x7" Dragon Card showing a Year of the Dog icon and fireworks. The U.S. stamp and Vietnamese stamps are tied by the U.S. B&W pictorial postmark — larger illustration (new window). Dgn 633: Sc. 5254 Year of the Dog — 5"x7" Dragon Card showing a Year of the Dog icon and fireworks; design similar to Dgn 632 but more narrow. The U.S. stamp and Taiwan’s souvenir sheet are tied by the U.S. pictorial postmark — larger illustration (new window). Dgn 633a: Sc. 5254 Year of the Dog — 5"x7" Dragon Card showing a Year of the Dog icon and fireworks; design similar to Dgn 632 but more narrow. The U.S. stamp and Japan’s four stamps are tied by the U.S. pictorial postmark — larger illustration (new window). Dgn 633b: Sc. 5254 Year of the Dog — 5"x7" Dragon Card showing a Year of the Dog icon and fireworks; design similar to Dgn 632 but more narrow. The U.S. stamp and Hong Kong stamps are tied by the U.S. B&W pictorial postmark — larger illustration (new window). Dgn 633c: Sc. 5254 Year of the Dog — 5"x7" Dragon Card showing a Year of the Dog icon and fireworks; design similar to Dgn 632 but more narrow. The U.S. stamp and Hong Kong souvenir sheet are tied by the U.S. B&W pictorial postmark — larger illustration (new window). Dgn 633d: Sc. 5254 Year of the Dog — 5"x7" Dragon Card showing a Year of the Dog icon and fireworks; design similar to Dgn 632 but more narrow. The U.S. stamp and Macau stamps are tied by the U.S. B&W pictorial postmark — larger illustration (new window). Dgn 633f: Sc. 5254 Year of the Dog — 5"x7" Dragon Card showing a Year of the Dog icon and fireworks; design similar to Dgn 632 but more narrow. 2 U.S. stamps are affixed, one tied by the Digital Color Postmark, the other by the B&W pictorial first-day cancel — larger illustration (new window). Dgn 635b: Sc. TBA Year of the Dog — 5"x7" Dragon Card reproducing Chinese iconography for the Year of the Dog. The artwork was designed by and licensed from a Singapore design firm — larger illustration (new window). Dgn 635c: Sc. TBA Year of the Dog — 5"x7" Dragon Card reproducing Chinese iconography for the Year of the Dog. The artwork was designed by and licensed from a Singapore design firm — larger illustration (new window). max18dog1: Sc. 3052 Year of the Dog — Canada Post picture postcard reproducing the domestic-rate stamp design on the face and as the indicia on the reverse. The domestic-rate stamp is applied to the face, and both it and the indicia are tied by first-day postmarks — larger illustration (new window). max18dog2: Sc. 3055 Year of the Dog — Canada Post picture postcard reproducing the international-rate stamp design on the face and as the indicia on the reverse. The international-rate stamp is applied to the face, and both it and the indicia are tied by first-day postmarks — larger illustration (new window). Dgn 223b: Sc. 2140 Year of the Dog — Canadian stamp only on the same 5"x7" Dragon Card showing a dog and fireworks. First Day of Issue hand cancel — larger illustration (new window). Dgn 223c: Sc. 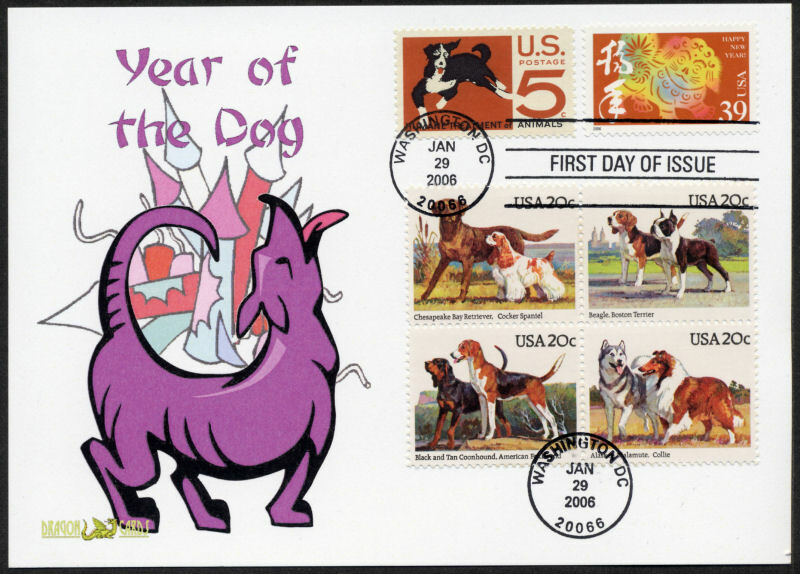 3997k Year of the Dog — Single from the 12-stamp sheet on a 5"x7" Dragon Card showing a dog and fireworks. First Day of Issue hand cancel With Sc. 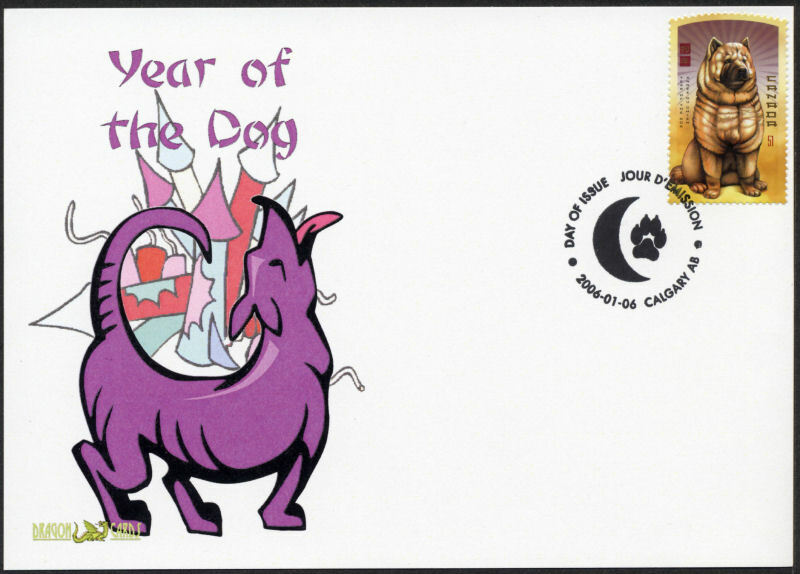 2140 Canadian Year of the Dog stamp and its own first-day cancel — larger illustration (new window). Dgn 223d: Sc. 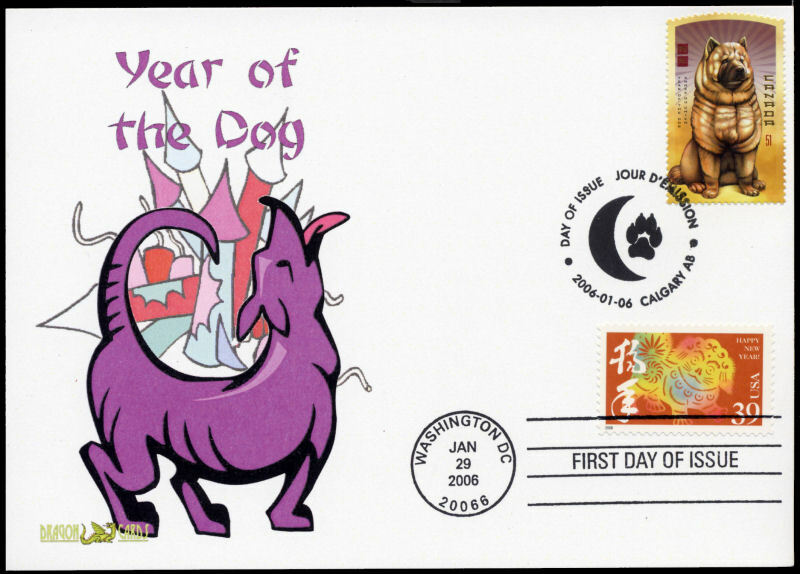 3997k Year of the Dog — Single from the 12-stamp sheet on a 5"x7" Dragon Card showing a dog and fireworks. First Day of Issue hand cancel With other dog stamps: Sc. 1307 Humane Treatment and 2098-2101 Dogs (8 breeds) — larger illustration (new window). Dgn 224: Sc. 3997 Lunar New Year — Full sheet intact on a 8½"x11" Dragon Card, First Day of Issue and CDS hand cancels — larger illustration (new window). Dgn 423g: Sc. 4623 Year of the Dragon — 5"x7" Dragon Card showing a Year of the Dragon icon and fireworks. U.S. First Day of Issue hand cancel ties U.S. and Taiwan stamps — larger illustration (new window). Dgn 424a: Sc. 4623 Year of the Dragon — 5"x7" Dragon Card showing a Year of the Dragon icon and fireworks - same design elements as Dgn 423 but more narrow. U.S. First Day of Issue hand cancel ties Hong Kong souvenir sheet and U.S. stamp — larger illustration (new window). Dgn 424b: Sc. 4623 Year of the Dragon — 5"x7" Dragon Card showing a Year of the Dragon icon and fireworks - same design elements as Dgn 423 but more narrow. U.S. First Day of Issue hand cancel ties Japan souvenir sheet and U.S. stamp — larger illustration (new window). Dgn 424c: Sc. 4623 Year of the Dragon — 5"x7" Dragon Card showing a Year of the Dragon icon and fireworks - same design elements as Dgn 423 but more narrow. U.S. First Day of Issue hand cancel ties Taiwan souvenir sheet and U.S. stamp — larger illustration (new window). Dgn 95: Sc. 3370 Year of the Dragon — green-on-white 5"x7" Dragon Card, Oriental dragon design, First Day of issue hand cancel; just 43 made. — larger illustration (new window). Dgn 95a: Sc. 3370 Year of the Dragon — As above, with pair of China Year of the Dragon stamps (5 made). Dgn 95b: Sc. 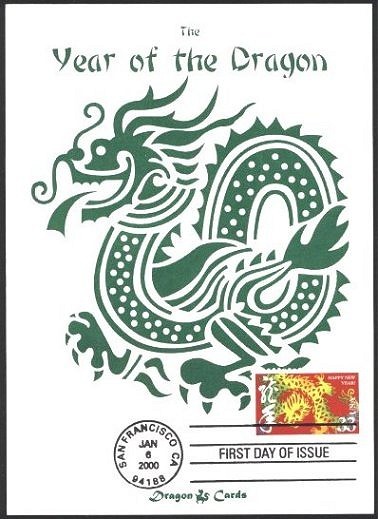 3370 Year of the Dragon — As above, with pair of Republic of China (Taiwan) Year of the Dragon stamps (5 made). Dgn 487i: Sc. 4846 Year of the Horse — Set of two 5"x7" Dragon Cards, each showing a Year of the Horse icon and fireworks. On each card, the U.S. first-day hand cancel ties the U.S. and two of the Hong Kong stamps — larger illustration (new window). Dgn 487k: Sc. 4846 Year of the Horse — 5"x7" Dragon Card showing a Year of the Horse icon and fireworks. The U.S. first-day hand cancel ties the U.S. and Macau stamps — larger illustration (new window). Dgn 487l: Sc. 4846 Year of the Horse — 5"x7" Dragon Card showing a Year of the Horse icon and fireworks. The U.S. first-day hand cancel ties the U.S. and Mongolia stamps — larger illustration (new window). Dgn 487m: Sc. 4846 Year of the Horse — 5"x7" Dragon Card showing a Year of the Horse icon and fireworks. The U.S. first-day hand cancel ties the U.S. and Philippines stamps — larger illustration (new window). Dgn 487n: Sc. 4846 Year of the Horse — 5"x7" Dragon Card showing a Year of the Horse icon and fireworks. The U.S. first-day hand cancel ties the U.S. and Singapore self-adhesive stamps — larger illustration (new window). Dgn 488: Sc. 4846 Year of the Horse — 5"x7" Dragon Card showing a Year of the Horse icon and fireworks. The U.S. first-day hand cancel ties the U.S. stamp and Taiwan souvenir sheet — larger illustration (new window). Dgn 488b: Sc. 4846 Year of the Horse — 5"x7" Dragon Card showing a Year of the Horse icon and fireworks. The U.S. first-day hand cancel ties the U.S. stamp and Macau souvenir sheet — larger illustration (new window). Dgn 488c: Sc. 4846 Year of the Horse — Set of two 5"x7" Dragon Cards, each showing a Year of the Horse icon and fireworks. On each card, the U.S. first-day hand cancel ties the U.S. and two of the Singapore stamps — larger illustration (new window). Dgn 488d: Sc. 4846 Year of the Horse — 5"x7" Dragon Card showing a Year of the Horse icon and fireworks. The U.S. first-day hand cancel ties the U.S. and two of the Singapore stamps — larger illustration (new window). Dgn 488e: Sc. 4846 Year of the Horse — 5"x7" Dragon Card showing a Year of the Horse icon and fireworks. The U.S. first-day hand cancel ties the U.S. and Singapore self-adhesive stamps — larger illustration (new window). Dgn 488f: Sc. 4846 Year of the Horse — 5"x7" Dragon Card showing a Year of the Horse icon and fireworks. The U.S. first-day hand cancel ties the U.S. and Japanese stamps — larger illustration (new window). Dgn 489a: Sc. 4846 Year of the Horse — 5"x7" Dragon Card showing a Year of the Horse icon and fireworks, but in a vertical format to accommodate Canada’s souvenir sheet. However, instead the U.S. stamp and its First Day of Issue hand cancel are affixed. — larger illustration (new window). MaxCanHorse: Sc. 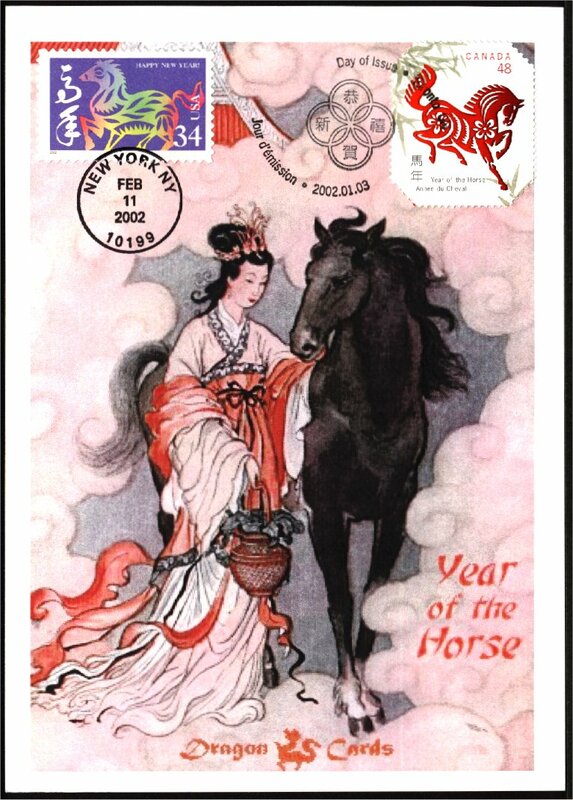 2699 Year of the Horse — Canada Post’s picture postcard featuring the same design. The matching stamp is tied on the front by the First Day of Issue hand cancel. The indicia (on the reverse which matches the front as well as the stamp) is also tied by the First Day of Issue hand cancel — larger illustration (new window). MaxCanHorsesouv: Sc. 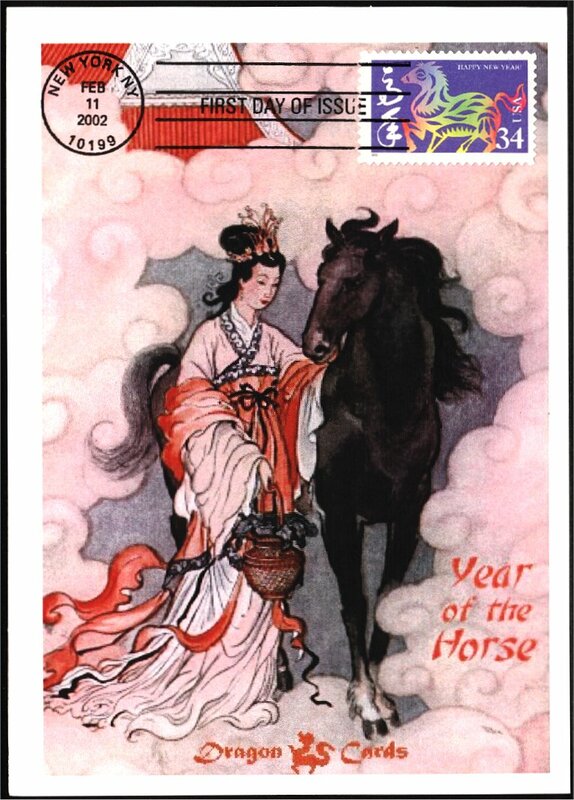 2701 Year of the Horse — Canada Post’s picture postcard featuring the same design. The matching stamp is tied on the front by the First Day of Issue hand cancel. The indicia on the reverse which matches the front as well as the stamp) is also tied by the First Day of Issue hand cancel — larger illustration (new window). Dgn 124: Sc. 3559 Year of the Horse — 5"x7" multi-colored Dragon Card showing a young woman with a horse. First Day of Issue hand cancel — larger illustration (new window). Dgn 124d: Sc. 3559 Year of the Horse — 5"x7" multi-colored Dragon Card showing a young woman with a horse; with Canada's Year of the Horse stamp, tied by its First Day of Issue cancel. The U.S. stamp is canceled with a circular date stamp cancel with its first day date — larger illustration (new window). Dgn 573c: Sc. 5057 Year of the Monkey — 5"x7" Dragon Card showing a Year of the Monkey icon and fireworks. The U.S. stamp and Taiwan souvenir sheet are tied by the U.S. First Day of Issue hand cancel — larger illustration (new window). Dgn 573f: Sc. 5057 Year of the Monkey — 5"x7" Dragon Card showing a Year of the Monkey icon and fireworks. The U.S. stamp is serviced on the more narrow design intended for souvenir sheets. — larger illustration (new window). Dgn 575b: Sc. 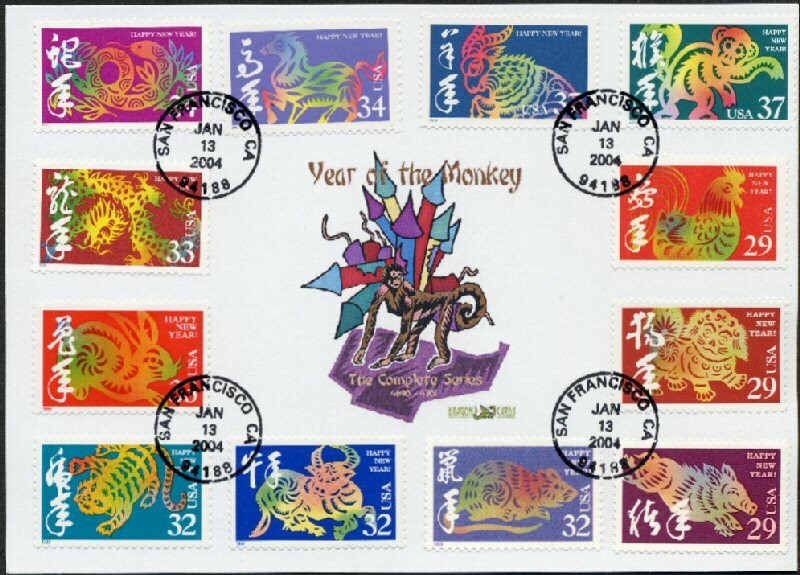 5057 Year of the Monkey — 5”x7” Dragon Card showing Asian-style drawings of monkeys and other lunar new year symbols. First Day of Issue hand cancel — larger illustration (new window). MaxCanMonk: Sc. 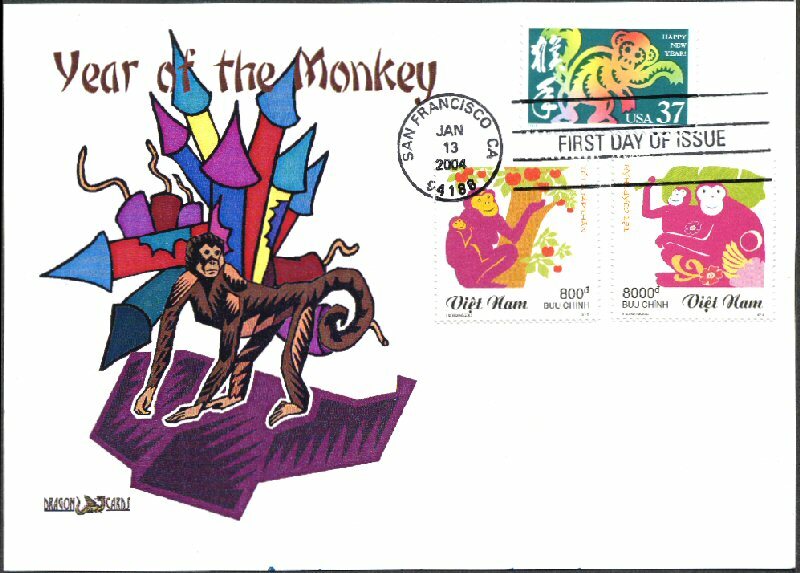 2884 Year of the Monkey — The domestic-rate stamp on Canada Post’s picture postcard for the domestic rate. The matching stamp is applied on the face. Both the stamp and the card’s indicia on the reverse are canceled by the first-day postmark — larger illustration (new window). Dgn 162: Sc. 3832 Year of the Monkey — 5"x7" Dragon Card with color pictures of Asian-style monkey and fireworks, First Day of Issue hand cancel — larger illustration (new window). Dgn 162a: Sc. 3832 Year of the Monkey — 5"x7" Dragon Card with color pictures of Asian-style monkey and fireworks, dual cancel with Canadian stamp and cancel — larger illustration (new window). Dgn 162b: Sc. 3832 Year of the Monkey — 5"x7" Dragon Card with color pictures of Asian-style monkey and fireworks, with Canadian stamp and its first-day cancel — larger illustration (new window). Dgn 162b1: Sc. 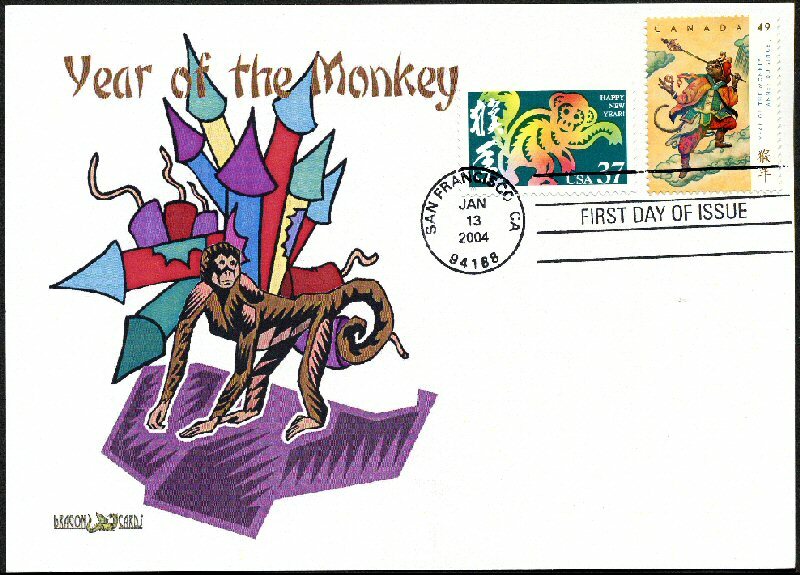 3832 Year of the Monkey — 5"x7" Dragon Card with color pictures of Asian-style monkey and fireworks, combination with Canadian stamp, 2004 tab. Dgn 162b2: Sc. 3832 Year of the Monkey — 5"x7" Dragon Card with color pictures of Asian-style monkey and fireworks, combination with Canadian stamp, upper left corner selvage. Dgn 162d: Sc. 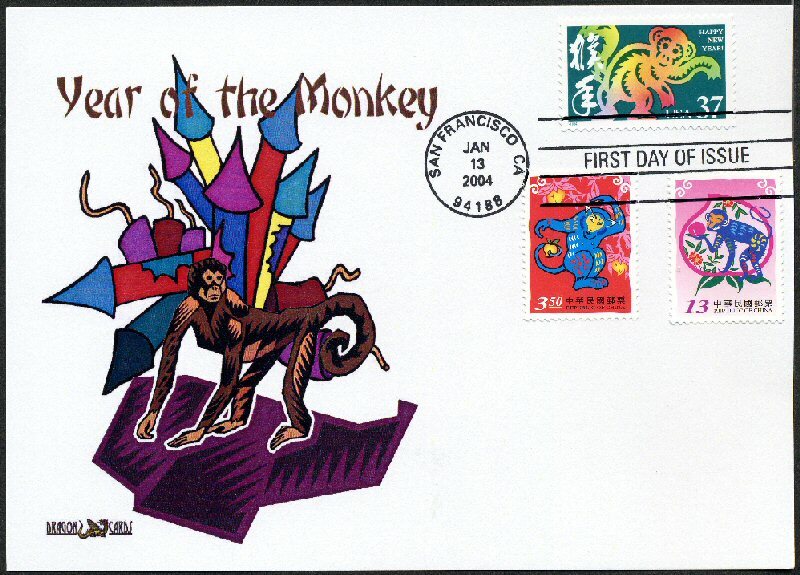 3832 Year of the Monkey — 5"x7" Dragon Card with color pictures of Asian-style monkey and fireworks, combination with 4 Hong Kong Year of the Monkey stamps, U.S. First Day of Issue hand cancel ties all — larger illustration (new window). Dgn 162e: Sc. 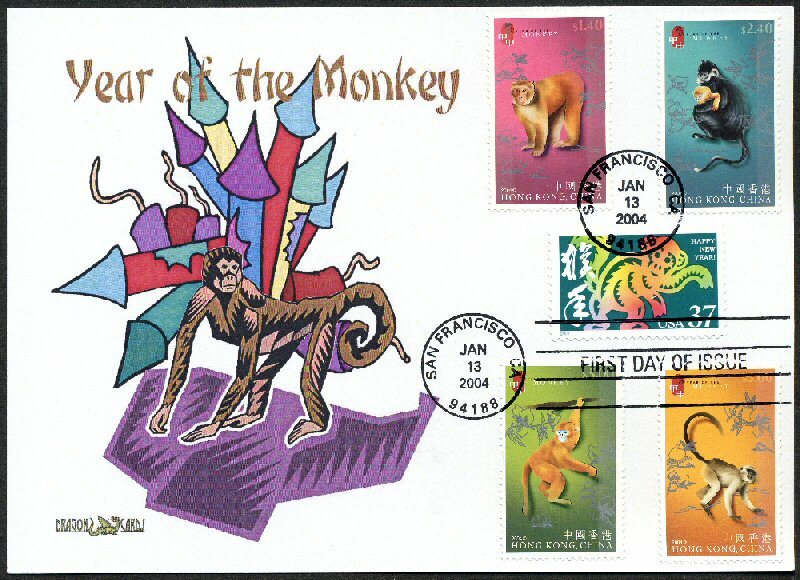 3832 Year of the Monkey — 5"x7" Dragon Card with color pictures of Asian-style monkey and fireworks, combination with 2 Singapore Year of the Monkey stamps, U.S. First Day of Issue hand cancel ties all — larger illustration (new window). Dgn 162f: Sc. 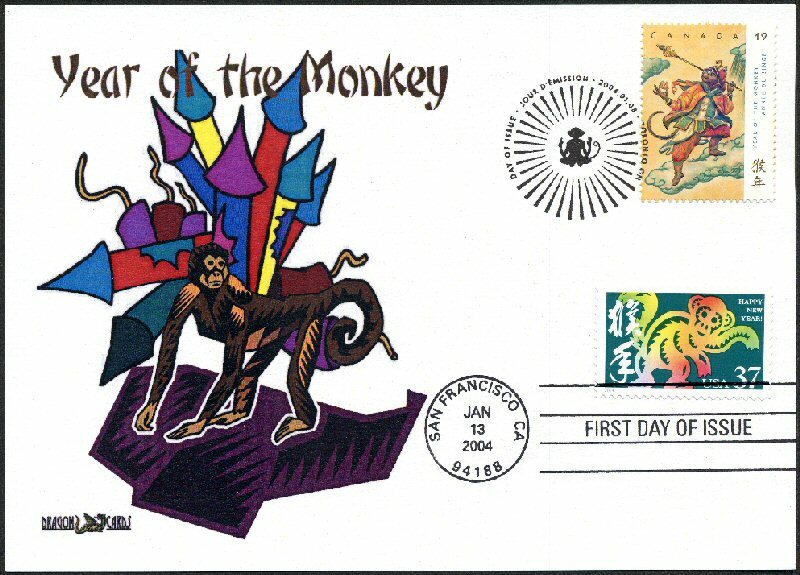 3832 Year of the Monkey — 5"x7" Dragon Card with color pictures of Asian-style monkey and fireworks, combination with 2 Vietnam Year of the Monkey stamps, U.S. First Day of Issue hand cancel ties all — larger illustration (new window). Dgn 162g: Sc. 3832 Year of the Monkey — 5"x7" Dragon Card with color pictures of Asian-style monkey and fireworks, combination with 2 Republic of China Year of the Monkey stamps, U.S. First Day of Issue hand cancel ties all — larger illustration (new window). Dgn 163: Sc. 3832 Year of the Monkey - Series — 5"x7" Dragon Card with color pictures of Asian-style monkey and fireworks, similar to Dgn 162, with all 12 Clarence Lee Lunar New Year stamps, tied with Monkey's first day hand cancels — larger illustration (new window).